With an elegant and youthful swing of the leg he's up and rolling. But she's way ahead of him. This is SOOOO obviously Photoshopped! EVERYONE who knows ANYTHING knows old people are too feeble to ride bikes and they NEED cars to get around anywhere! This is how it's ALWAYS been, duhhh! Think you could put one over on us North Americans at the summit of global civilizzzzation, did you? Besides, old people like that riding bikes are threatening everyone's basic God-Given FREEDOM to drive their car. @ Kiwehtin - Think again! This is far from photoshopped. I have lived in Copenhagen for four months and it's hard to believe the incredible cycle culture until you see it. These older people in the picture are not even the oldest that I have seen. Very elderly people probably about 75 years of age with grey hair can be seen riding around the city, along with heavily pregnant women and three year old children (without training wheels!). I don't see how old people riding bikes impedes on anyone's freedom to drive their car but if they chose to ride a bike instead of drive them props to them right? I think K-guy was kidding. This is very nice though. I don't think I've ever seen an elderly person riding a bike in real life. "Very elderly people probably about 75 years of age"
Talk about coincidence, I just came in from talking to a woman who is older than 75 starting out to the drugstore on her bike. It's up the valley wall and she's not quite as young as she used to be, so she takes the switchback route now rather than the direct; on her one speed. She still likes to yell "Wheeee!" on her way back down. 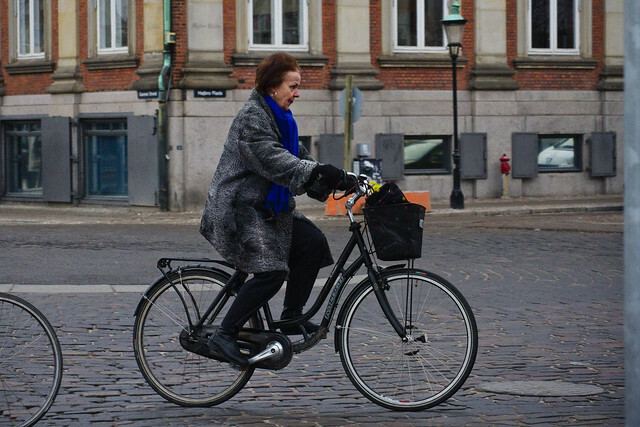 My granny lives in a Danish town of about 16.000 people, and she rode her bike well into her 80's. When she started to have problems with her balance she was given a three wheeled bike by the city and that gave her a few years extra. Now she's 86 and gave up riding her bike last year because of poor eyesight. She misses it though. 'I don't get around town anymore' she says. Anon - That's why god invented tandems and grandchildren. I'm one of the people who cheers Mikael whenever he puts up pictures of older people or handicapped people. I was impressed and encouraged to see the same kind of thing when I spent time in the Netherlands. Even here in Montreal, where cycling could take up a much greater share in everyday transportation, you do see the occasional older person pedalling around. Still, nothing like what you see in societies that have made more intelligent social choices. I live in a compound with mainly elderly people, 70 and over. Most of us have bicycles and use them, for the simple reason that cycling costs less energy than walking at that age. 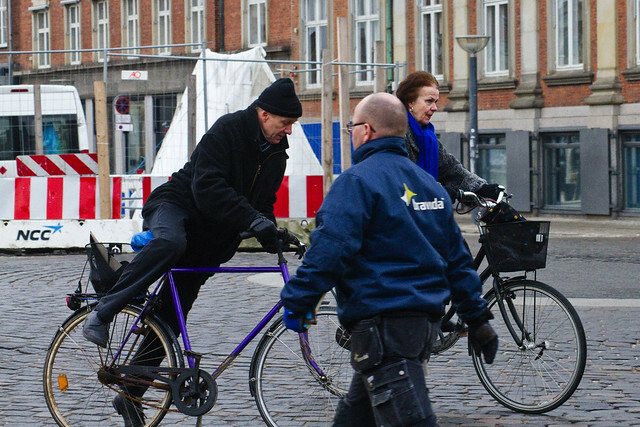 Mikael's photos show why so many men in the Netherlands prefer a step-through frame. It allows them to keep up with their wives :-).